Stan James is a brand most well known in the UK with over 90 betting shops across the country. Their online presence isn’t as large as some other European brands but their main focus is on the UK, which may make them a better choice for people in the United Kingdon. Their 200% up to $1,375 opening poker bonus offer is pretty solid, and they also offer a $10 bonus without a required deposit, which is given out in tournament tickets. Stan James offers a 200% up to $1,375 poker bonus and is currently ranked #15 out of 28 reviewed poker rooms with an overall score of 74.40. Visit www.StanJames.com for more details and to download the official Stan James software. If you’re looking to signup at Stan James, it’s likely you’re hunting for a no deposit bonus. If that’s the case, you have found an offer that truly is free with no deposit needed along with no clearing requirements. To claim this offer, you can use our links to visit Stan James, which will help support the website. It’s only for new accounts, so upon visiting you will have to signup and create a brand new account. There is nothing special you have to do, or any code that needs to be entered. Upon completing your account, the $10 will be credited to your account the following Monday morning. In other words, if you signup on Tuesday, you won’t receive the $10 until 6 days later. This delay can be a bit annoying, but rest assured your funds will arrive. Every Monday at 19:45 UK time. Every Tuesday and Wednesday at 21:00 UK time. These are both multi-table tournaments, so if you play well and get a good run of cards, the $10 free could turn into hundreds more. The tickets also do not have an expiration, so you can save them and use them when you’re ready. While this free money offer is a bit limiting, it comes with the added bonus of not requiring any wager or clearing requirements. In other words, if you win $500 in one of the tournaments, that money is yours to do as you please immediately, including cashing it all out and making it rain once it hits your bank account. After the no deposit bonus has been claimed, if you’re looking to make an actual deposit, you can take advantage of their 200% up to $1,375 deposit bonus. This bonus requires no bonus code, it’s automatic upon making your first deposit. A minimum deposit of $10 is required. The bonus is split into two parts, 200% up to $1,250 offer and a 20% instant bonus, up to $125. The instant bonus is credited to your account immediately, which means if you deposit $625 for the max bonus, you will actually have $750 in your account. However, this instant bonus must be cleared within 7 days, which is explained below. Since the instant bonus has such a short expiration (only 7 days), let’s start there. This bonus requires earning 10 times the amount in loyalty points. This means the maximum amount ($125) would require 1,250 points. The $1,250 deposit bonus is given out in 50 equal chunks. This means the max $1,250 bonus is awarded in 50 increments of $25. Each increment requires earning 1,250 points. The total $1,250 bonus will require 62,500 points. The full amount must be earned within 60 days. Loyalty Points are awarded at the rate of 10 per $1 in fees or rake paid. This means 1,250 points for the instant bonus would require paying $125 in rake. Doing the math shows the instant bonus has a sick value of 100% return. Just make sure you can clear $125 in rake in one week since the bonus is all or nothing! Failure to earn 1,250 points in 7 days means the instant bonus will be removed from your account. The $1,250 deposit bonus requires paying $125 for each $25 chunk, bringing the value much lower than the instant bonus at 20%. The overall value of both together is 21.57%. It will be hard to make pace on this one at the lower stakes as it requires a total of $6,375 in rake within 67 days. This beings the pace per day to $95.15, or 951.49 points per day. Honestly, it’s highly unlikely that most players will be able to clear the full bonus. But it’s not impossible, see the hand charts below to get a better idea. Stan James’ VIP Program uses a fixed cashback % for Loyalty Points. At the highest level (which is where you will be placed if you make pace) you will earn 30% rakeback. There are also bi-monthly rake race leaderboards based on how many points are earned during a two week period. The top 40 places award cash, with 1st place earning $700. It’s impossible to give this a fixed value since it depends on how many points other players earn as well. But if you were to earn pace for the bonus (951.49 points per day) you would stand to gain an extra $100-$200 every two weeks. Using the lowball value of $100, you will collect an additional $400 from these leaderboards bringing the total VIP value up to 36.27%. To put that another way, the total rake required for the bonus is $6,375, and you will receive around $2,312.50 of that back just from points alone. The value from the loyalty points ends up being much larger than the actual bonus. The total value, both the bonus and VIP, is 57.84%. The below table shows an approximation of how many hands it will take to clear the full $1,375 bonus. These numbers may not 100% exact and should be used as an average to give you a general idea, rather than an accurate amount. This is because the rake generated varies widely based on playing style. In general, aggressive players generate more rake while more conservative players generate less rake. Therefore, if you tend to play more aggressive, it may take you fewer hands, whereas if you play more tight, it may take you more hands. 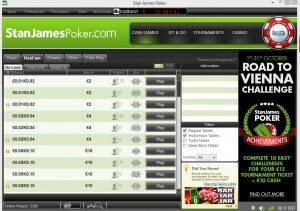 If you’re looking to play now, you can visit StanJames.com now from your PC or Mac and start earning your $1,375 deposit bonus! Looking to get started? Signup at Stan James through Bonus Ace by using the link above. New players can receive the 200% up to $1,375 opening bonus offered, described in this review.